Australia 7-273 (Ed Cowan 86, David Warner 71, Steven Smith 58*, Ravindra Jadeja 3-56, Ishant Sharma 2-41) vs. India. Ed Cowan and David Warner provided an ideal beginning to the Kangaroos innings which was let down by their middle order as India fought back well in the game. The Australian openers initiated bravely by putting 139 runs together as the tourists managed 273 for the loss of seven wickets in 104 overs. Australia preferred to go in the match with two spinners, Xavier Doherty and Nathan Lyon, along with two fast bowlers, Mitchell Starc and Peter Siddle. India left out their off spinner Harbhajan Singh who was replaced by the left arm spinner, Pragyan Ojha, and retained the rest of the team which won the first two Tests. The third Test of the four match series commenced on Friday, March 15, 2013 that was the second day of the match since the first day’s play was washed out due to rain. Earlier, Michael Clarke, the captain of Australia, won the toss and opted to bat on a good looking wicket. Ed Cowan and David Warner opened the innings in a positive manner as the latter hit 2 consecutive fours in the very first over. Warner was the most attacking of the two and hit 5 fours in the first 10 overs as compared to just 5 runs scored by Cowan off 28 balls he faced. Cowan hit his first boundary in the next over and hit 2 more in the 25th over as Warner kept on cruising from his end. 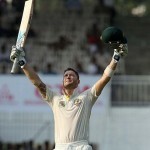 The strong partnership resulted in the first hundred of the innings in the 34th over as David Warner achieved his 7th Test fifty two overs later. The association between the openers kept on flourishing as Ed Cowan completed his sixth Test half century on the first ball of the 40th over with a four. The score was taken to 139 in 47.5 overs when India got the first breakthrough as David Warner was caught behind by MS Dhoni off Ravindra Jadeja for 71 off 147 with 9 fours. 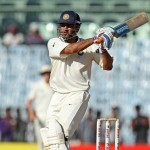 Michael Clarke came into bat in an ideal situation but was stumped smartly by Dhoni on the very next ball of Jadeja for a duck. Phillip Hughes came in next as the home bowlers checked the scoring rate and the batsmen found it difficult to score the runs at ease. Hughes got his first run on the 20th ball he faced and became the victim of Pragyan Ojha for just two runs in the 60th over. Steven Smith got together with Cowan next and the first opened his account with a four. Smith looked in a different mood and hit 1 six and 1 four in the 66th over as Cowan kept on consolidating from the other end. Smith survived a huge leg before wicket appeal in the 73rd over as Cowan was dropped by Cheteshwar Pujara off Ravichandran Ashwin at 85 runs. Ed Cowan was unable to capitalize on the chance and was caught by Virat Kohli at slip off Ashwin for 86 from 238 balls with 8 fours as the total touched 198 in 78 overs. Brad Haddin walked in the center as Steven Smith was playing a responsible knock. 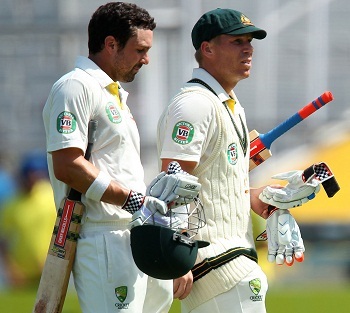 Haddin made his intentions clear by hitting a six in the next over and punished Jadeja for 3 fours in the 88th over. The partnership was enhanced to 244 after 93 overs when Ishant Sharma delivered a magical over. He dismissed Brad Haddin for 21 by uprooting his stumps on the first delivery of the next over and clean bowled Moises Henriques for a duck two balls later. The Kangaroos lost their sixth wicket at 244 as Steven Smith posted his third Test fifty on the second ball of the 95th over. Peter Siddle survived 13 deliveries but he was declared lbw off Jadeja for 0 and he was replaced by Mitchell Starc who added 10 runs in the 100th over with 2 fours. Starc remained unbeaten for 20 and Steven Smith secured his end with 58 off 137 comprising 1 six and 7 fours as the visitors scored 273 runs in 104 overs with three wickets still in hand. Ravindra Jadeja was the main wicket taker with three, Ishant Sharma held two whereas Ravichandran Ashwin and Pragyan Ojha claimed one wicket each. India has fought back nicely in the game by grabbing seven rival wickets and will anticipate folding the tail early on day three whereas Steven Smith is capable of taking Australia to a stable position.